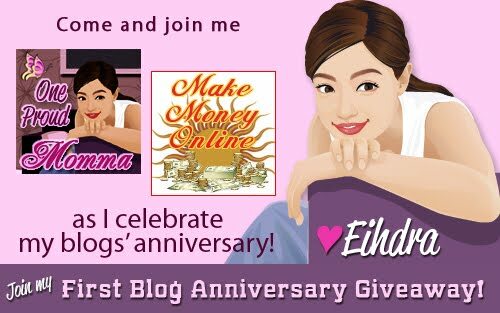 Win Tory Burch bag, Cartier bag, San San makeup, Furano Mango Tops and more designer items from Eihdra of One Proud Mama and Make Money Online as she celebrates her first blogversary giveaway with a bang! • Subscribe to her blog feeds via email and confirmation link. See full contest mechanics at One Proud Momma and win those prizes via her point system. Hi. A sponsor changed domain url. Kindly change Mirage's url to http://www.me.gmirage.com. Also, all sponsors' links must be clickable and DoFollow. Otherwise, this entry will be void. Please change one sponsor's url from http://jaredslittlecorneroftheworld.blogspot.com/ to http://ethanjared.com/. Thanks!